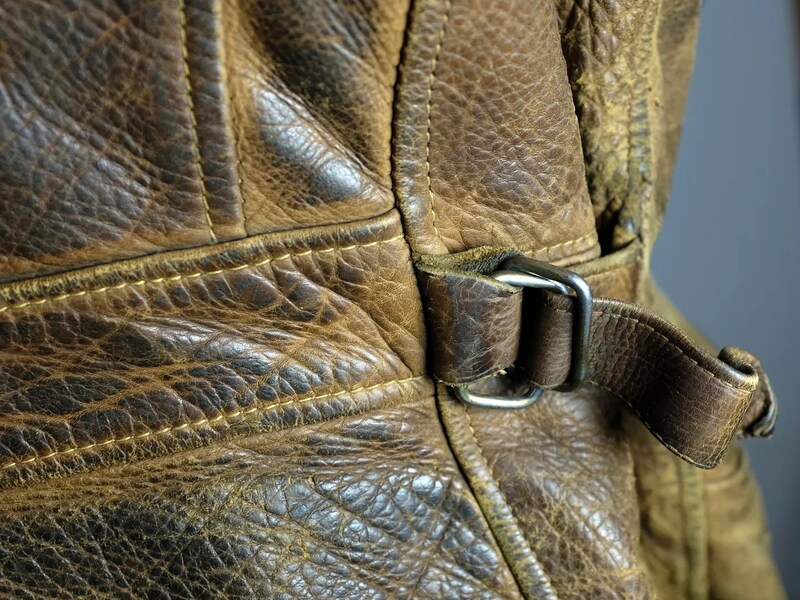 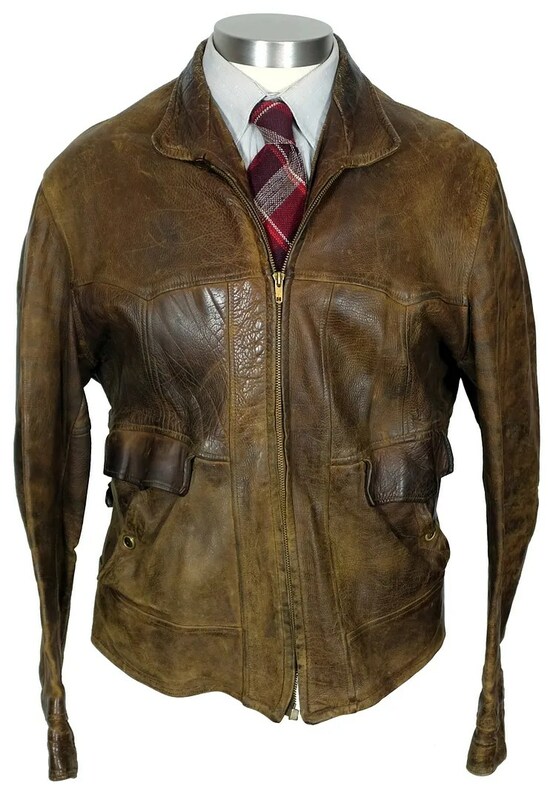 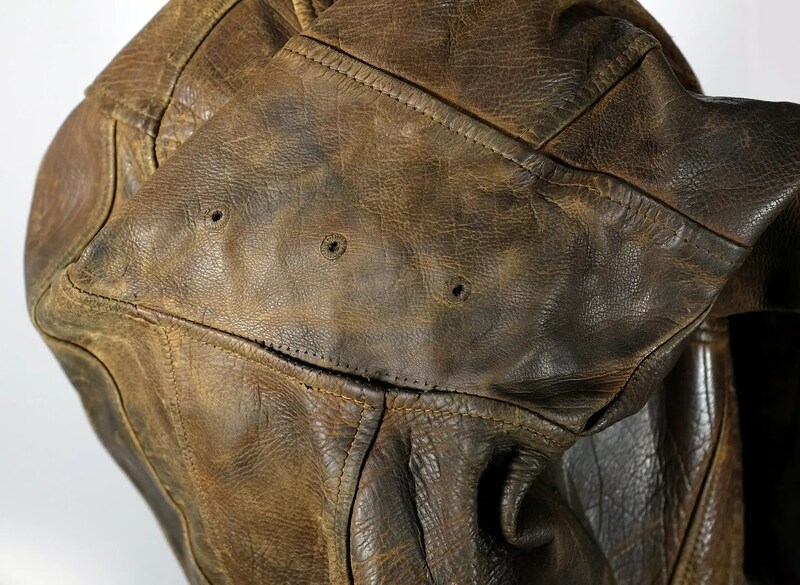 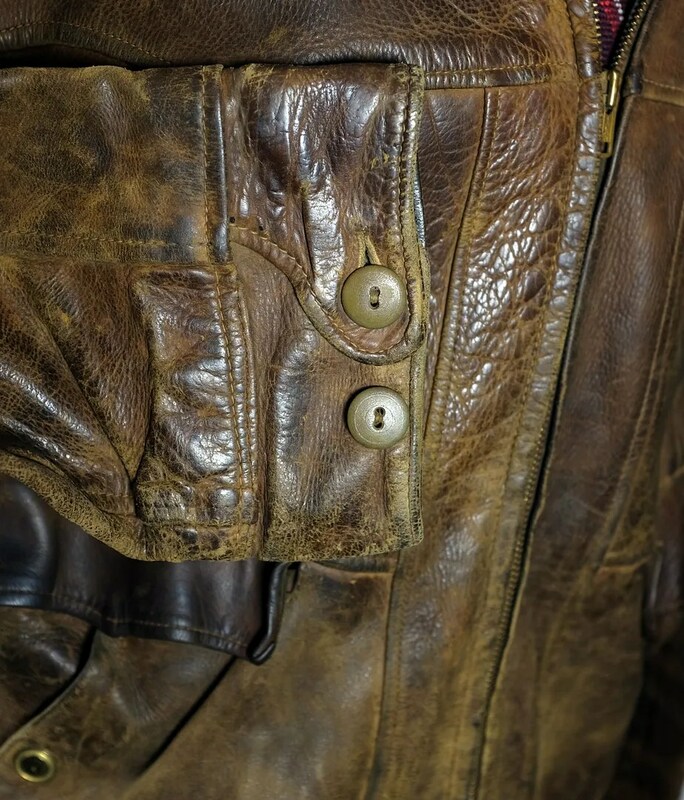 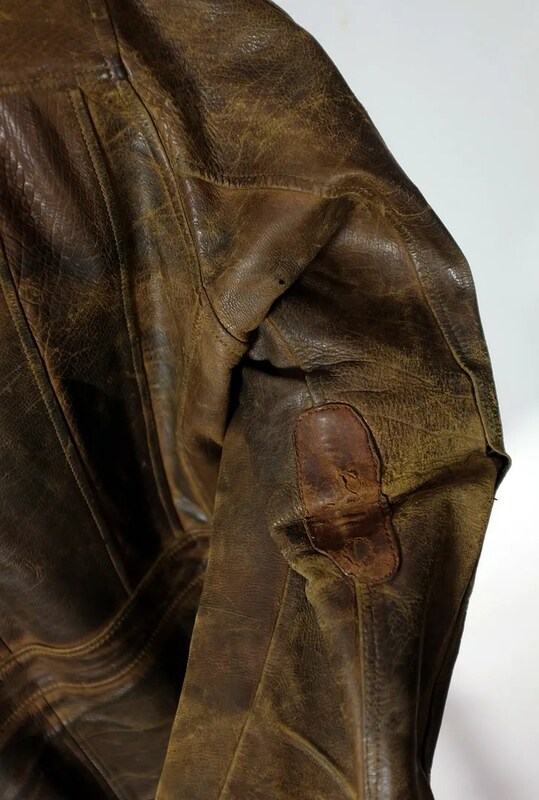 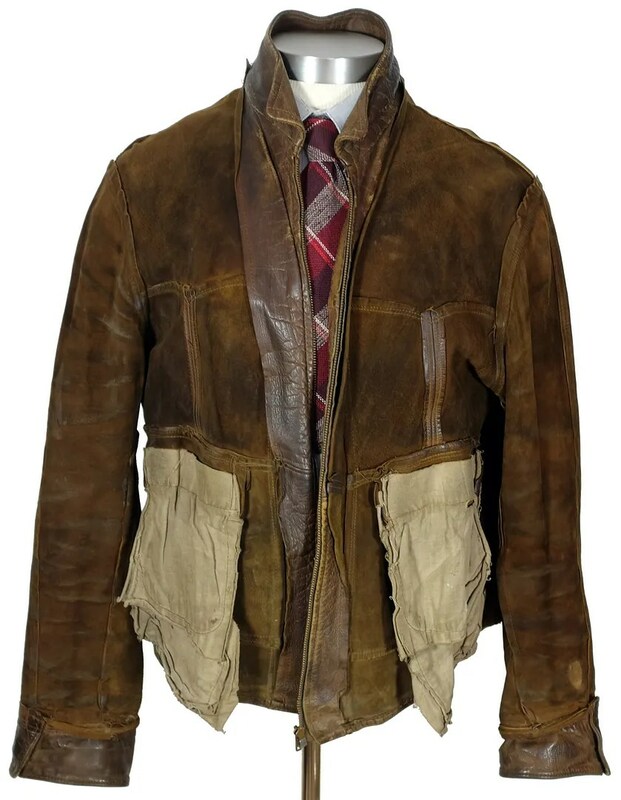 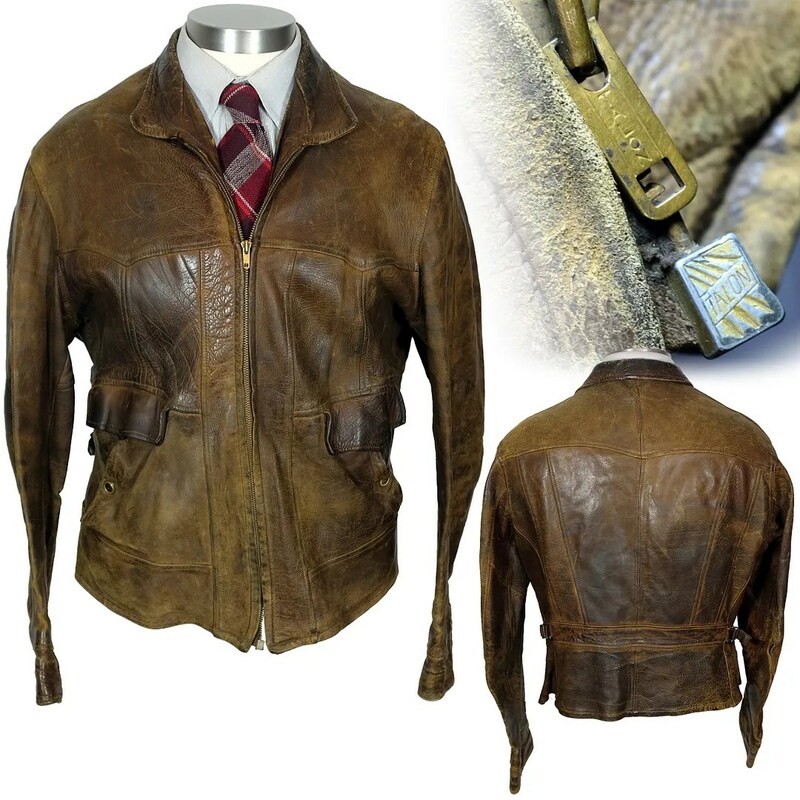 This vintage leather jacket was made in the mid 1930s. 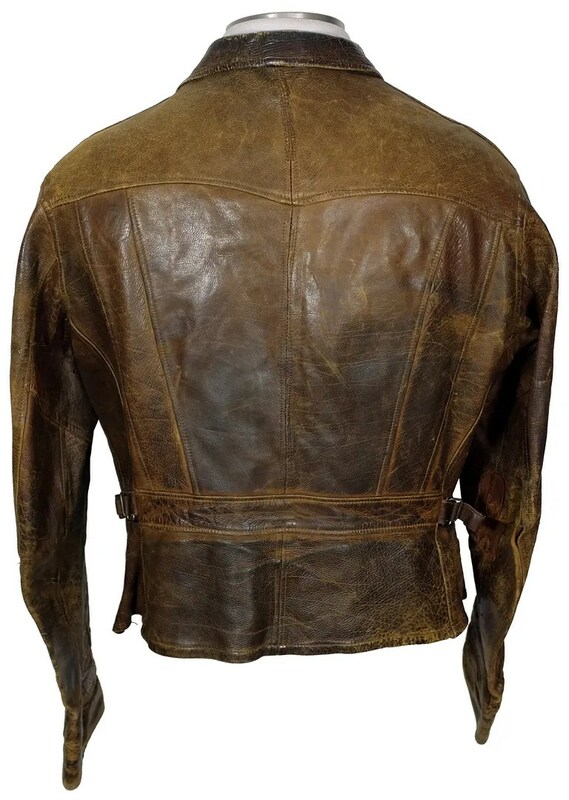 It is made from heavy leather, with an incredible grain to many of the panels.With such heavy wear and differences panel to panel, it’s hard to make a definitive asdessment of the leather, Panels like the back feel distinctly horsehide, but some of the grainier ones remind me more of a heavy buckskin. 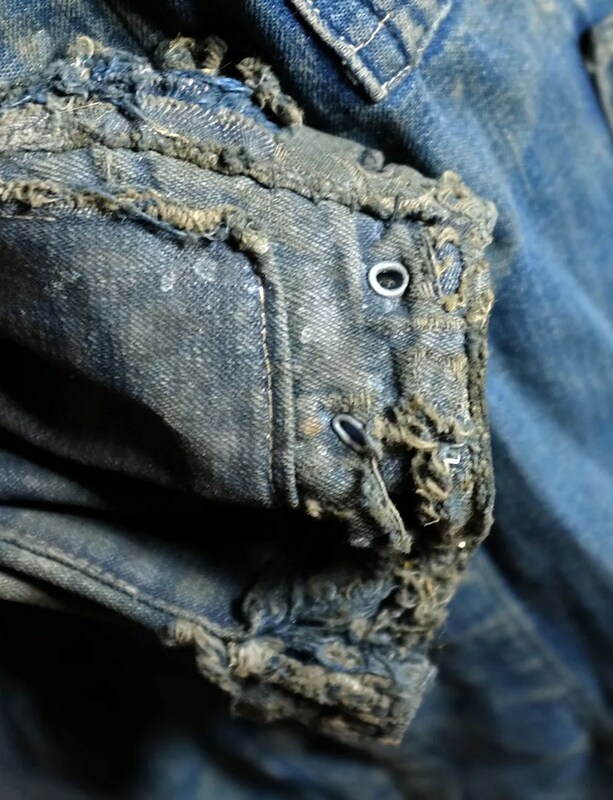 Either way, phenominal grain and patina. 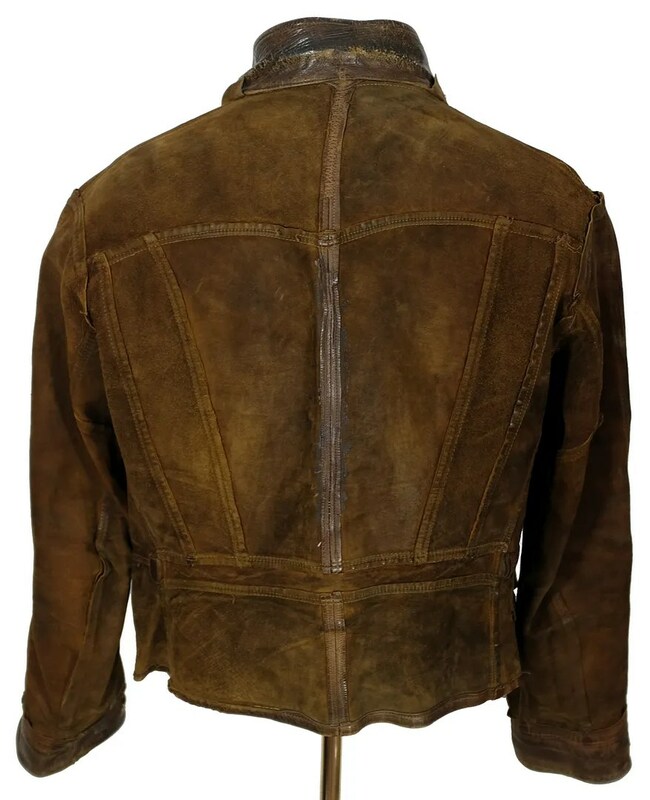 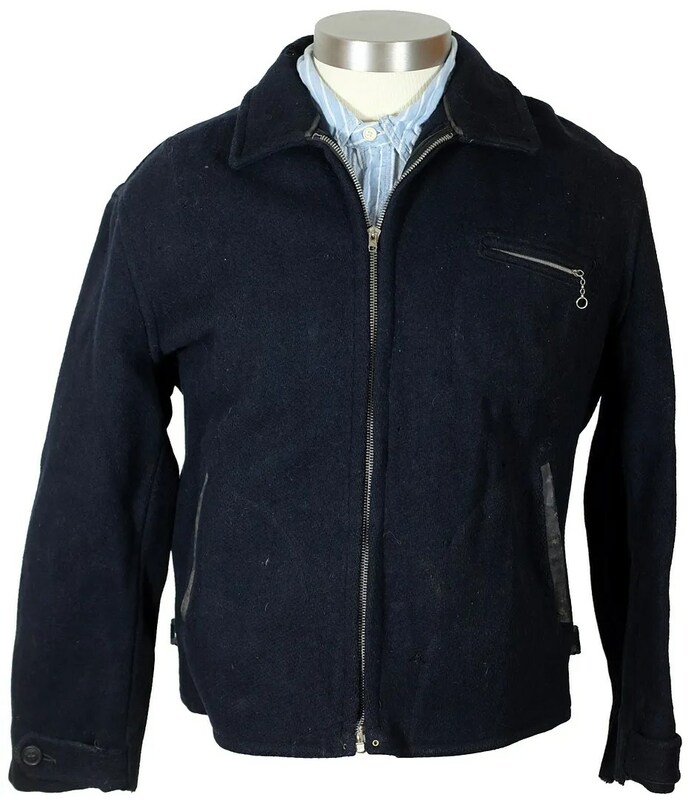 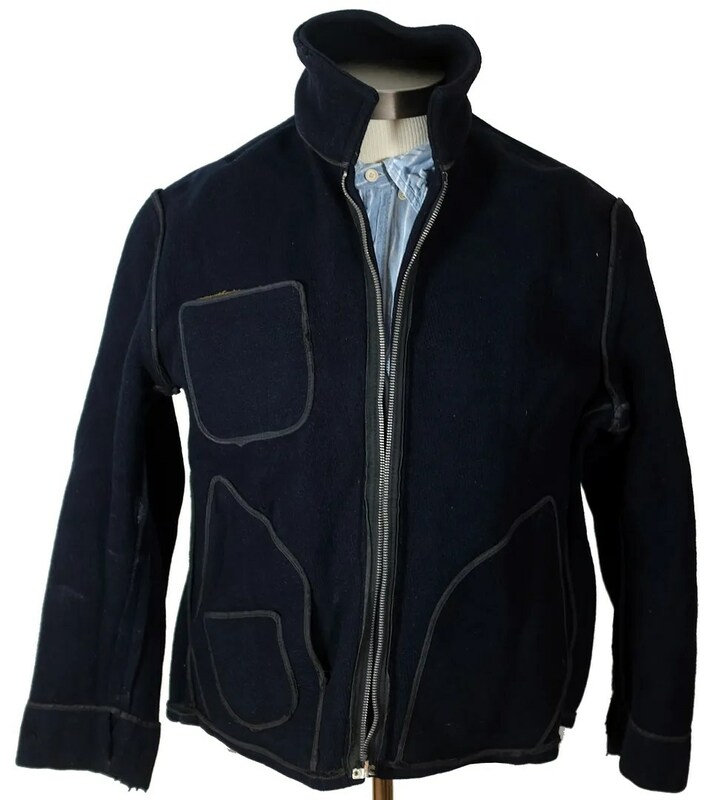 It is an early style Cossack jacket, with a leather waistband and short rounded collar. 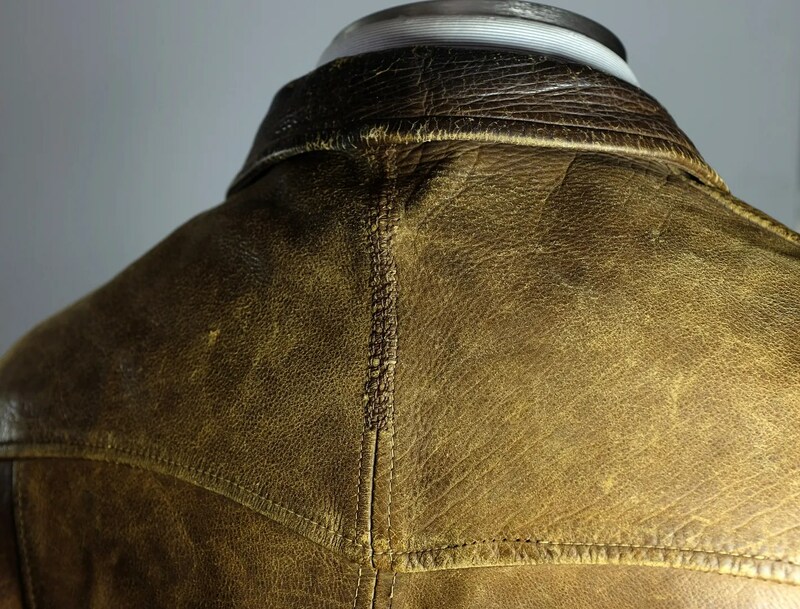 The front of the jacket has some rare detailing, with yoked shoulders leading to a vertical front seam. 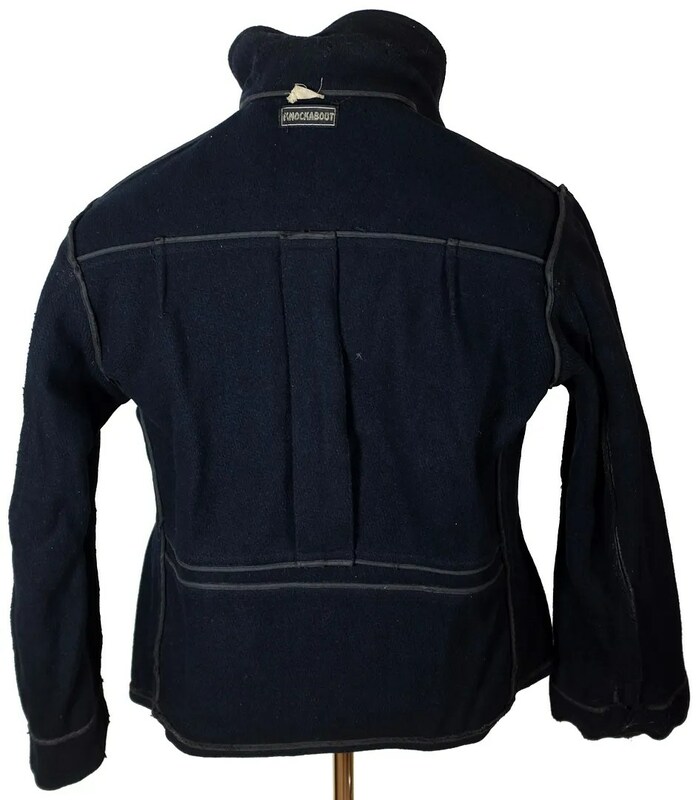 It has handwarmer pockets with flapped top entry pockets. 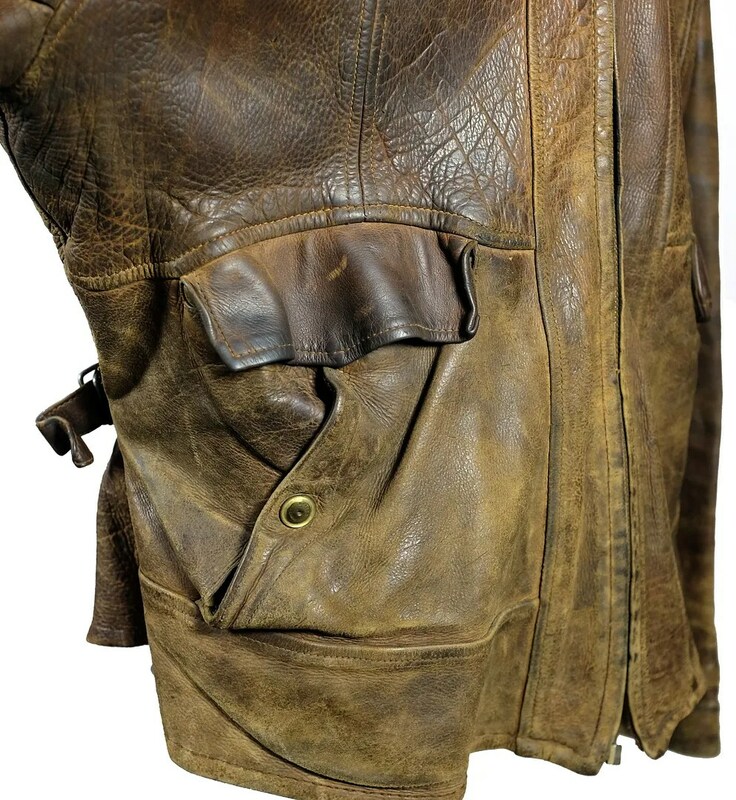 The handwarmers close with large early production United Carr snaps of a variant I have never seen before. 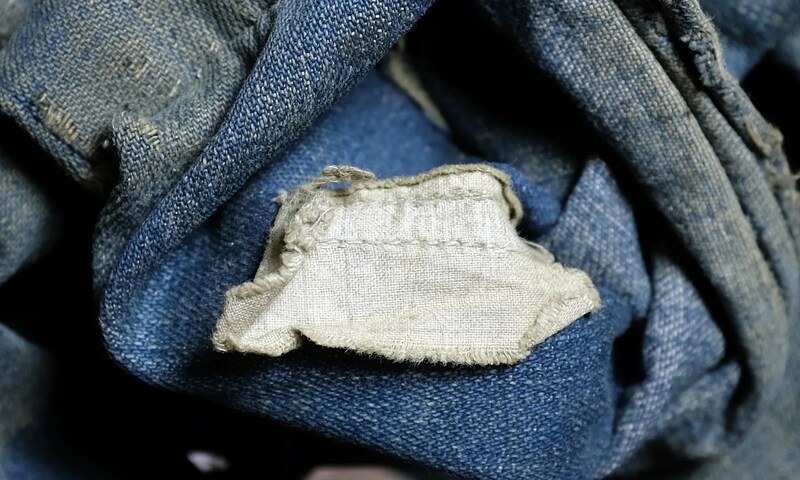 They are trimmed with scalloped stitching. 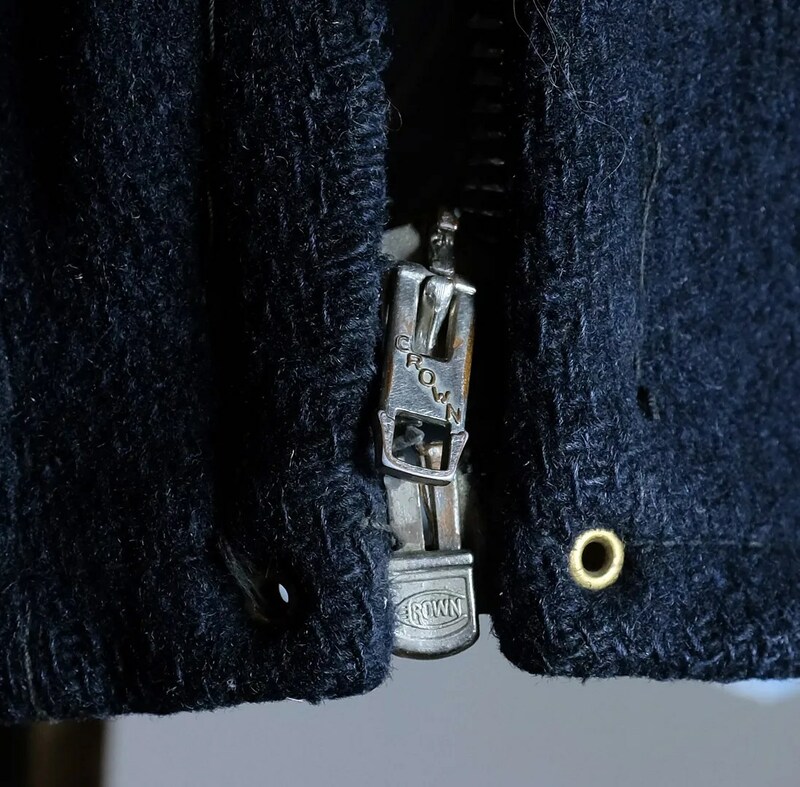 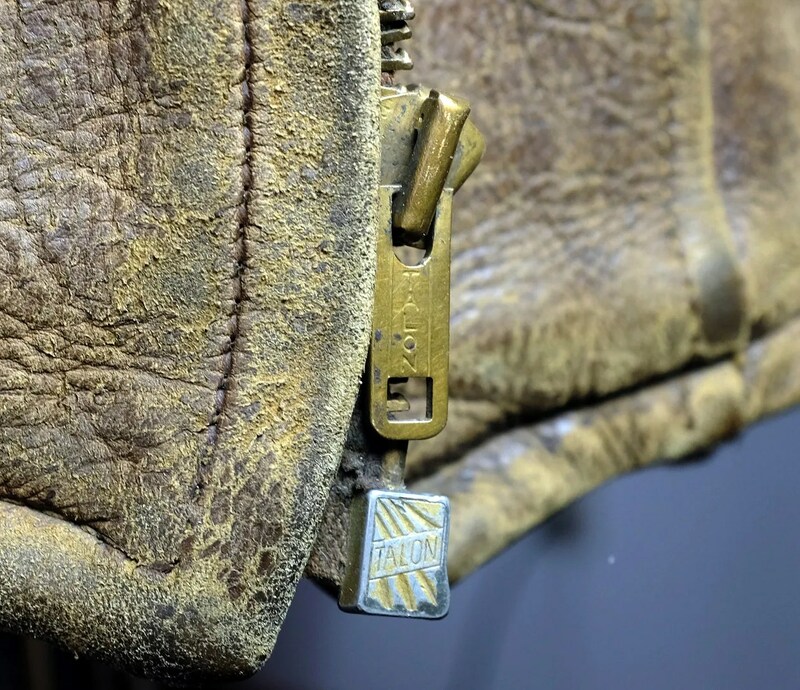 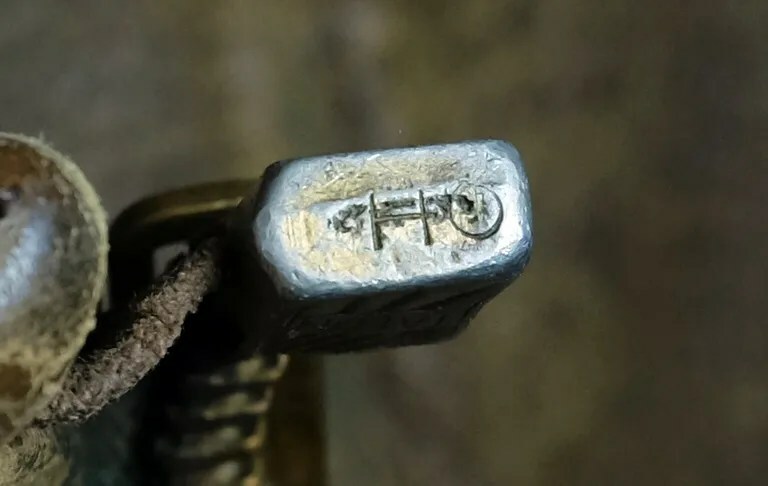 The main zipper is an early (mid 1930s) sunburst stop box Talon which has been repaired at some point with a 1950s slider. 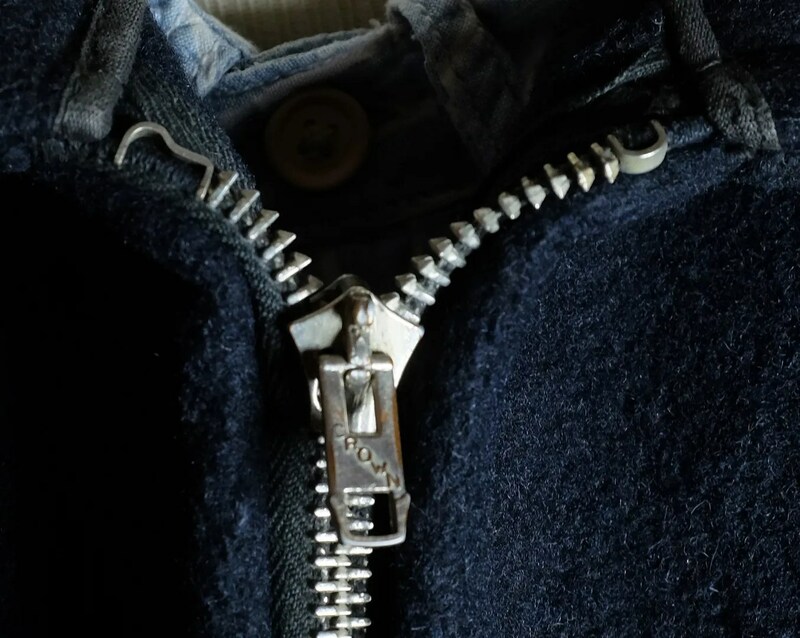 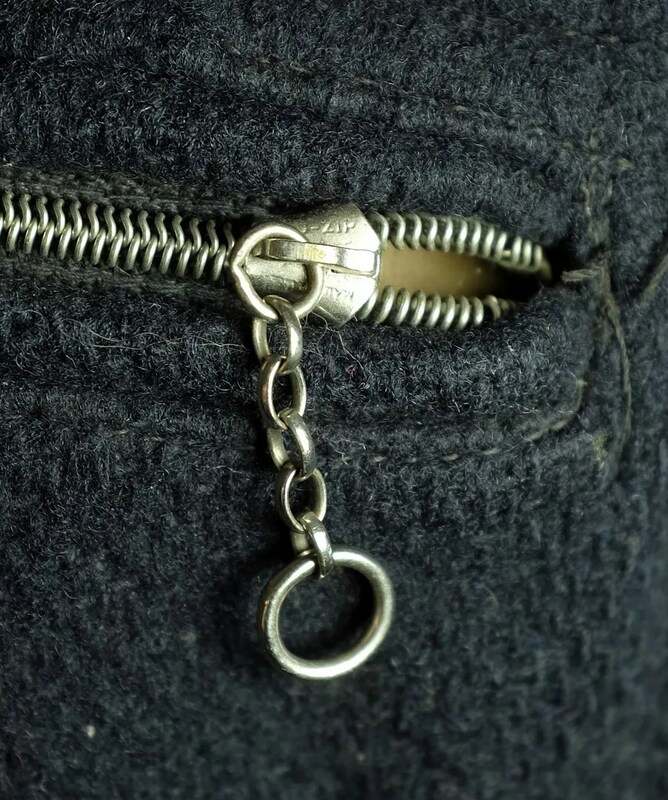 The zipper needs to be replaced. 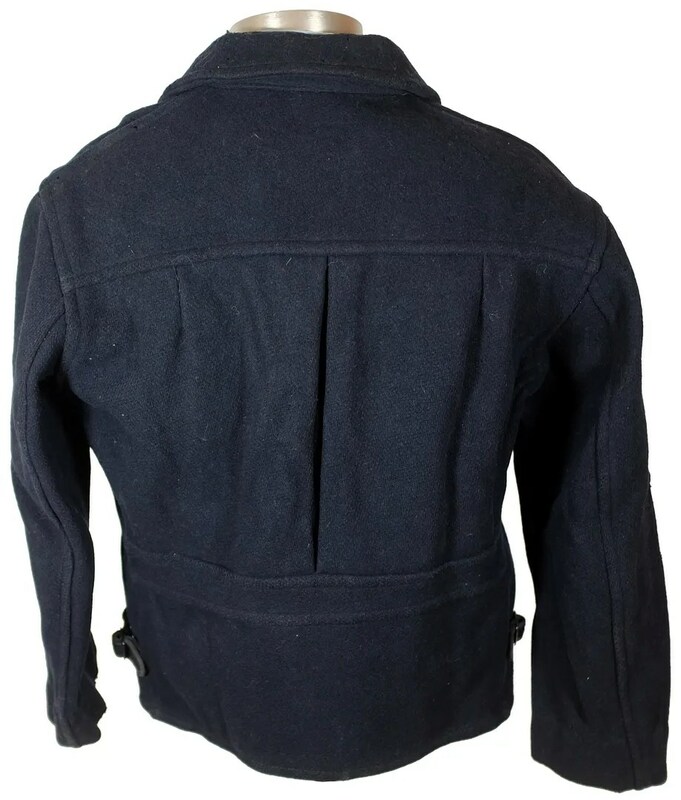 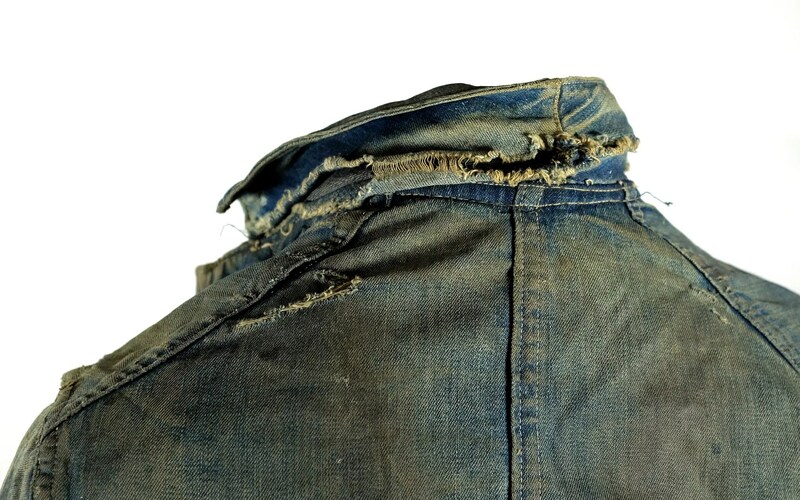 The back is yoked, with a half-belt, center seam and decorative pleats. 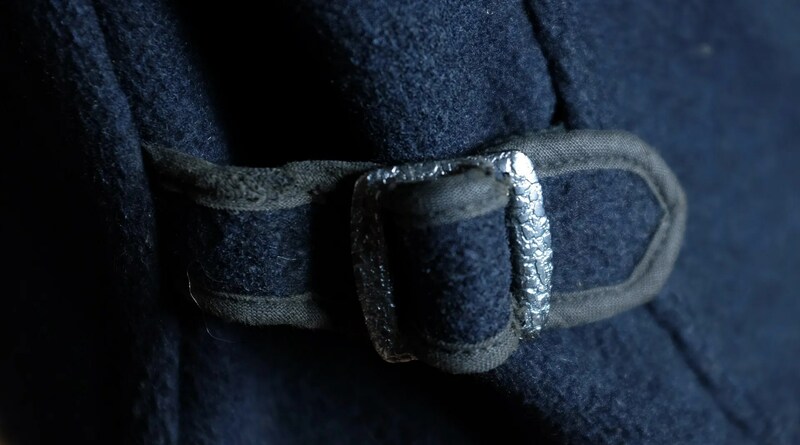 There are stitched eyelets to the underarm panels. 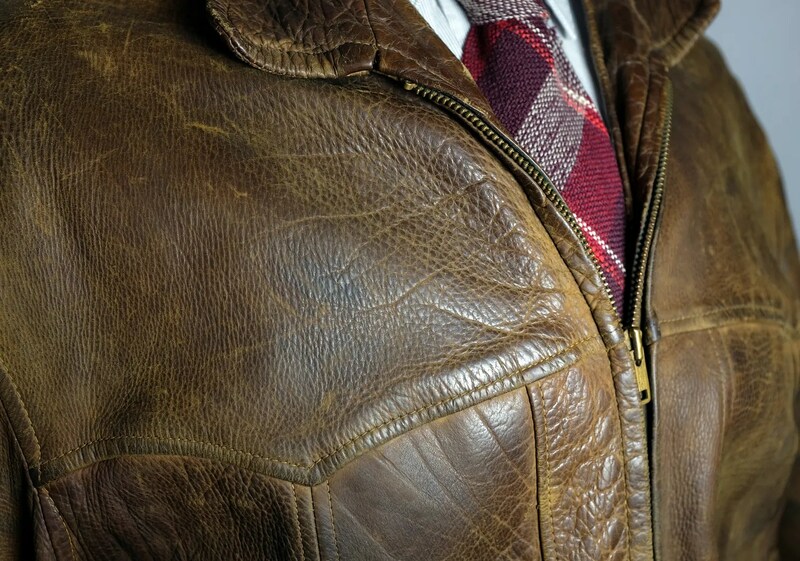 The jacket is missing the lining. 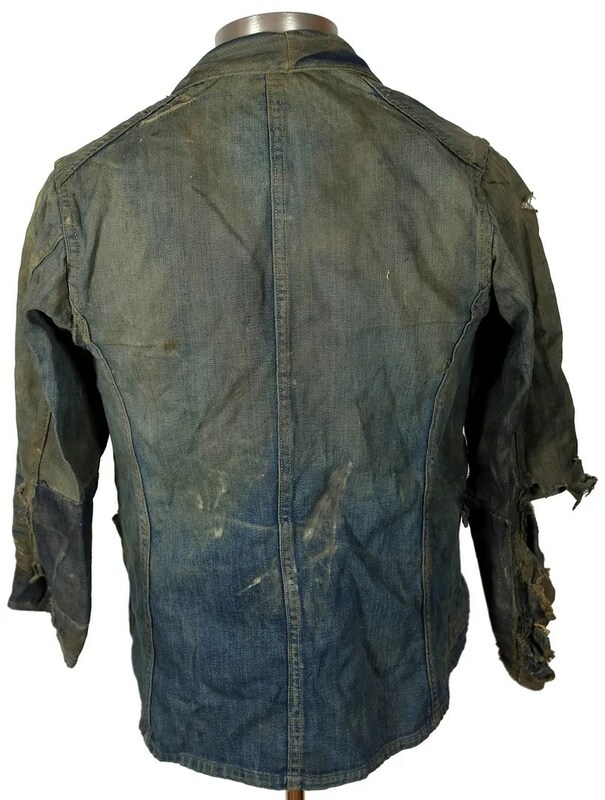 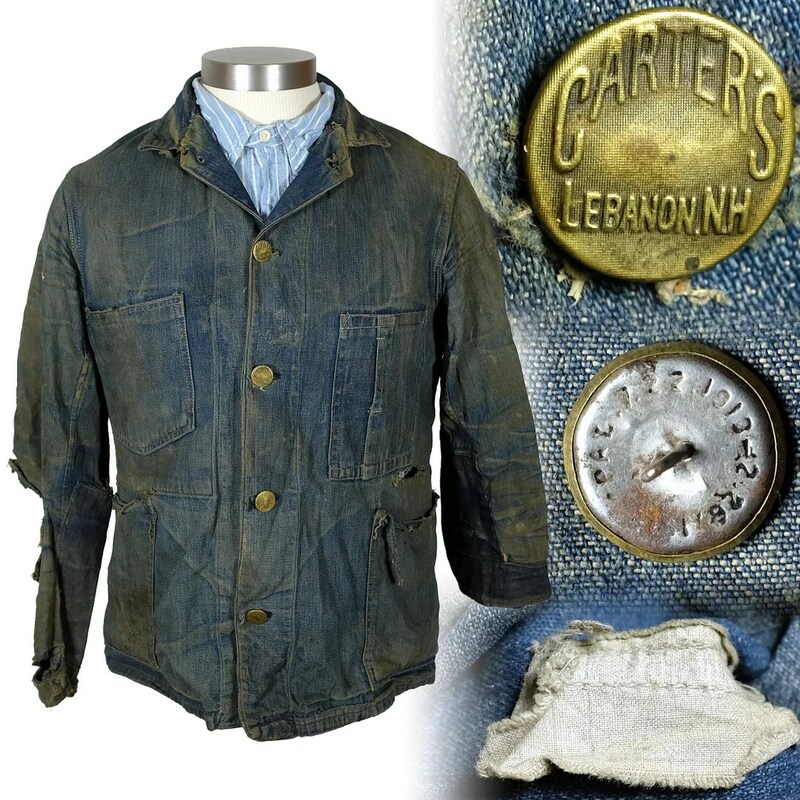 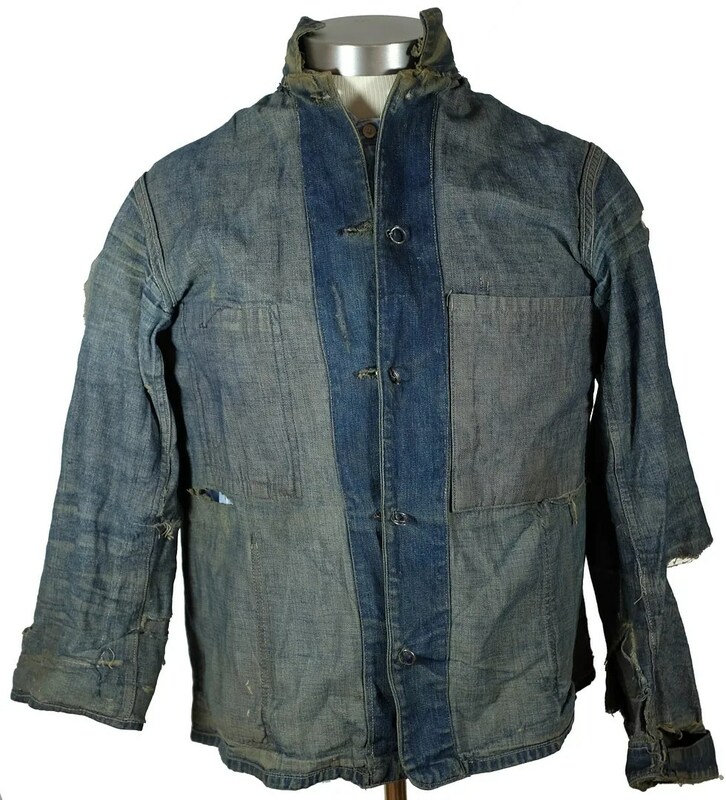 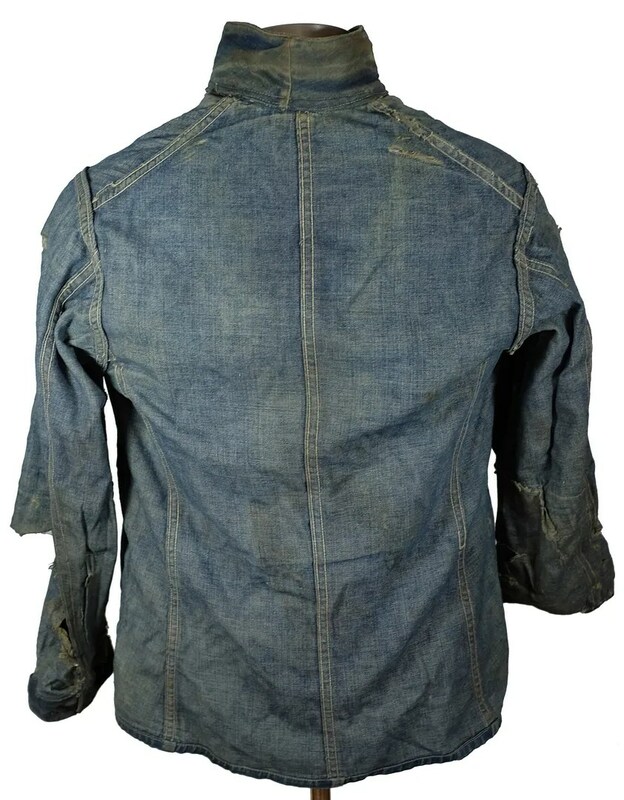 This vintage denim jacket was made by Carter’s (H.W. 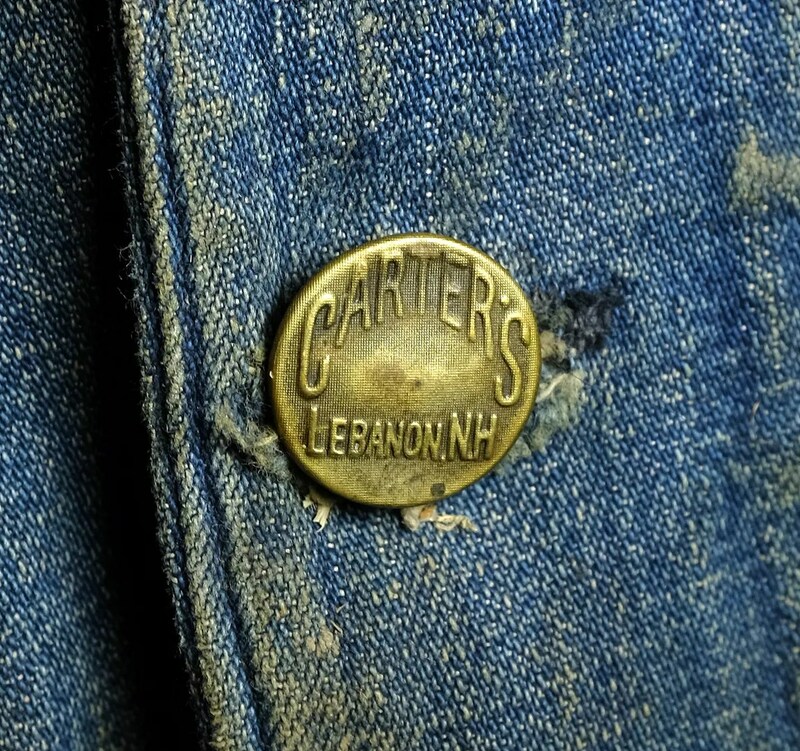 Carter) of Lebanon, New Hampshire. 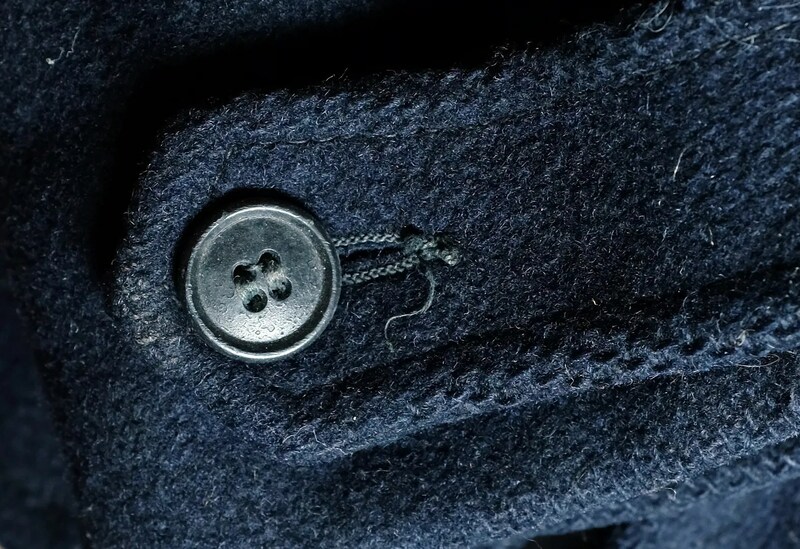 It has a five button front (including the collar button) and four pockets on the front with an additional one inside. 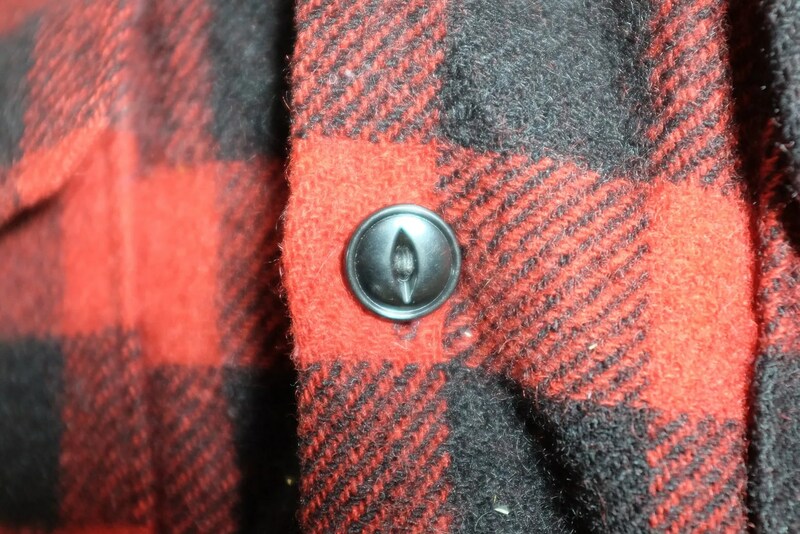 It has ring-back buttons with metal grommet reinforcement. 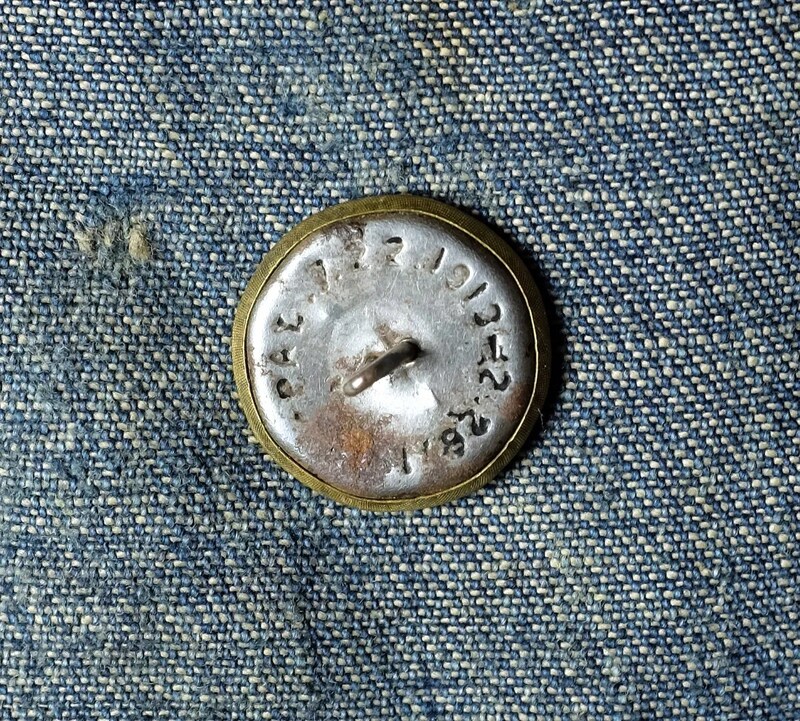 The back of the buttons has patent dates from 1913 and 1917. 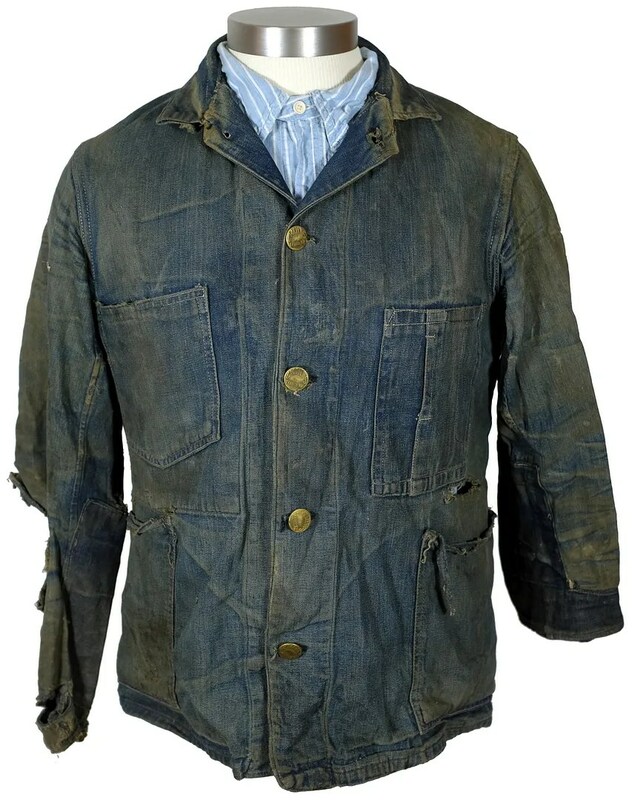 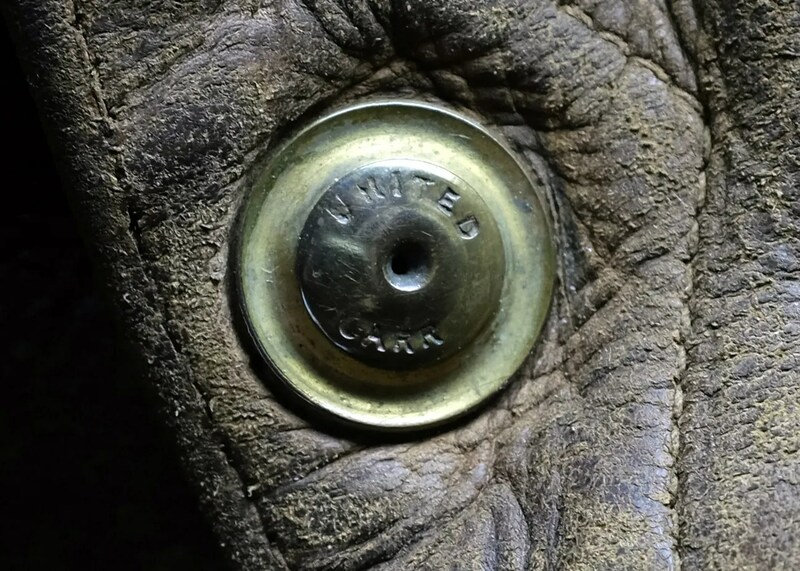 The jacket bears an early variant tag from the United Garment Workers of America. 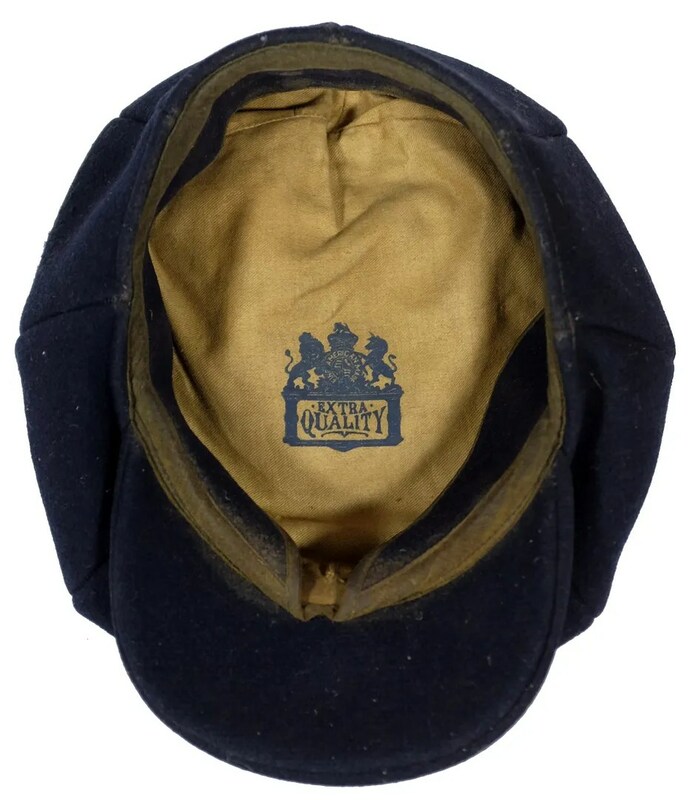 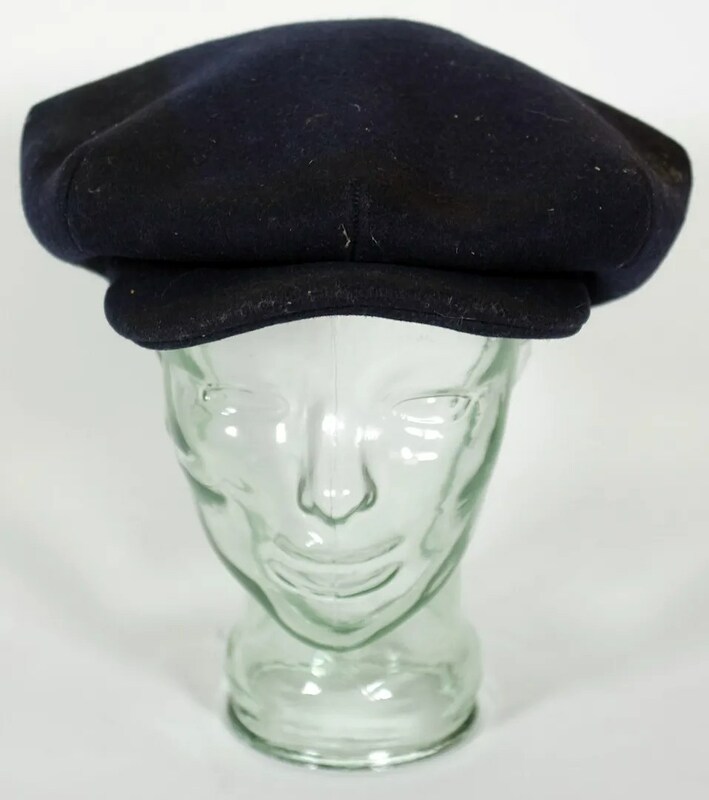 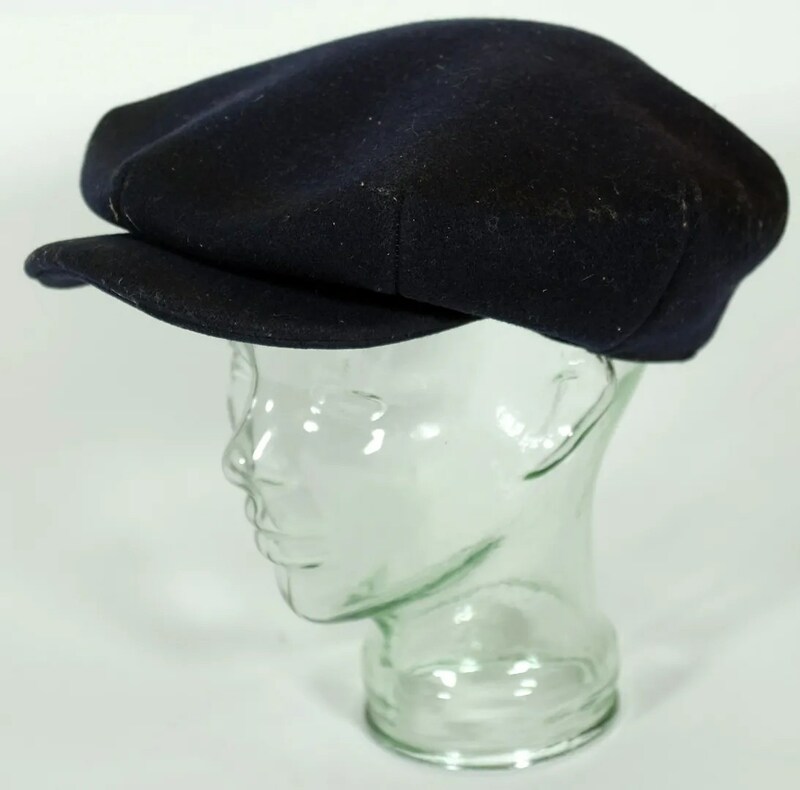 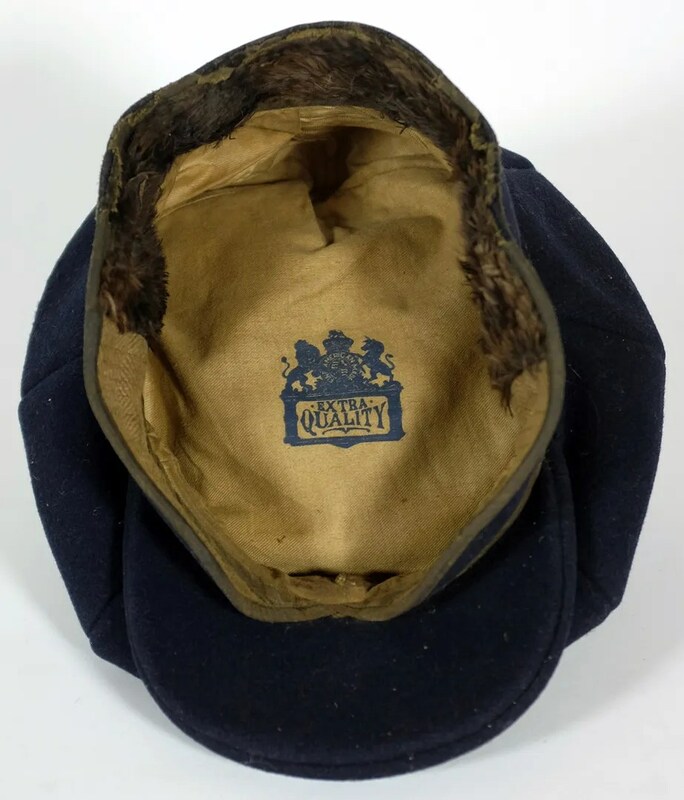 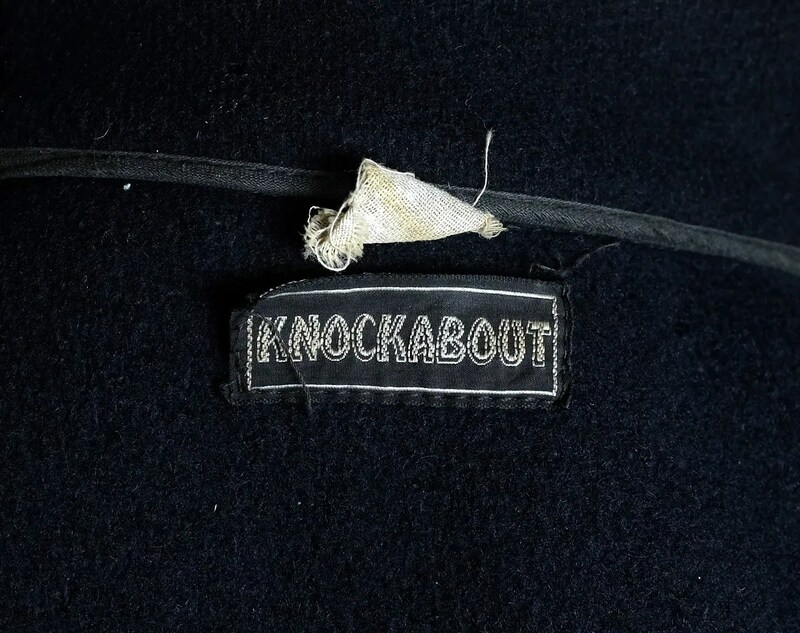 This vintage cap was made in the 1920s – early 1930s and is marked “Extra Quality”. 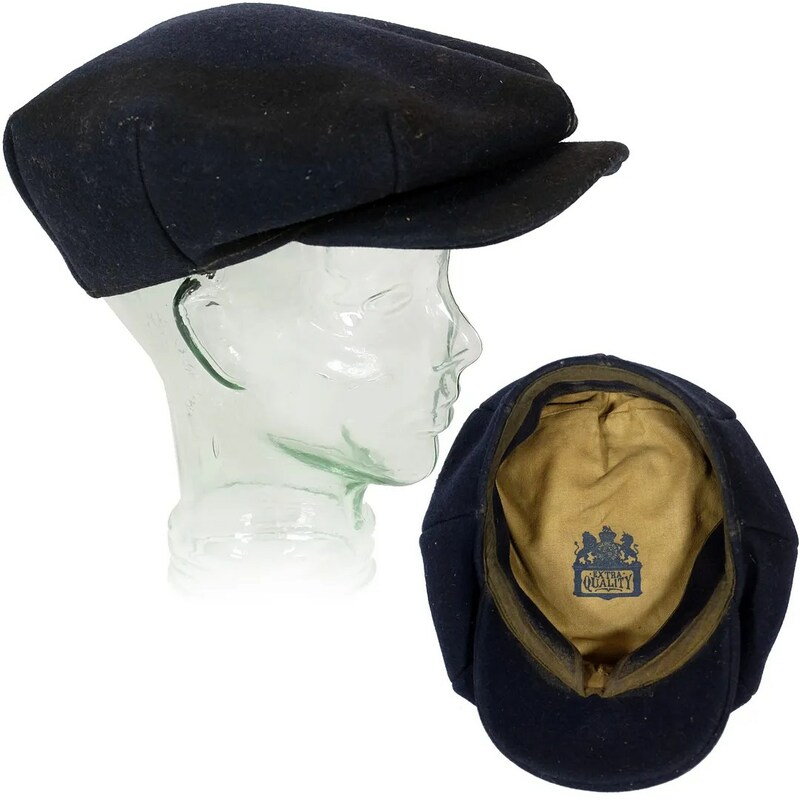 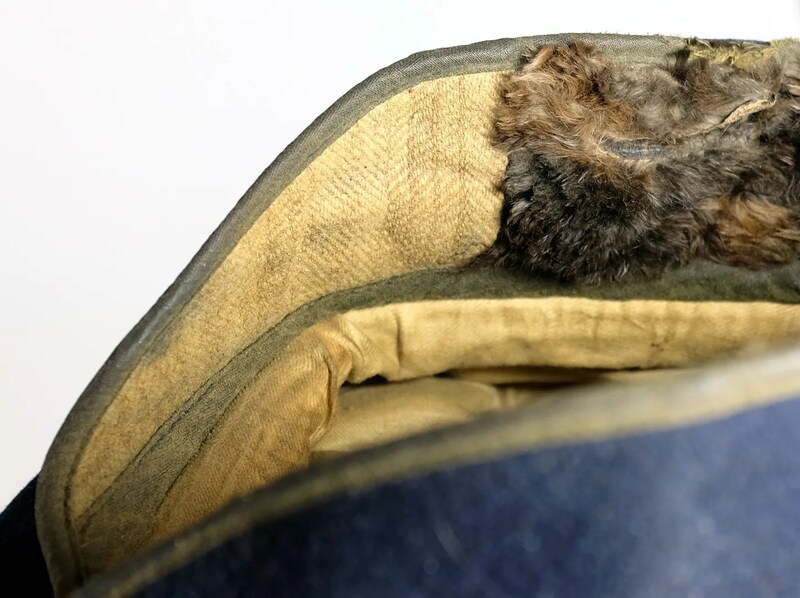 It is made of heavy mackinaw wool, with a one piece, eight pleat design, herringbone and fur lined earflaps and a snap brim. 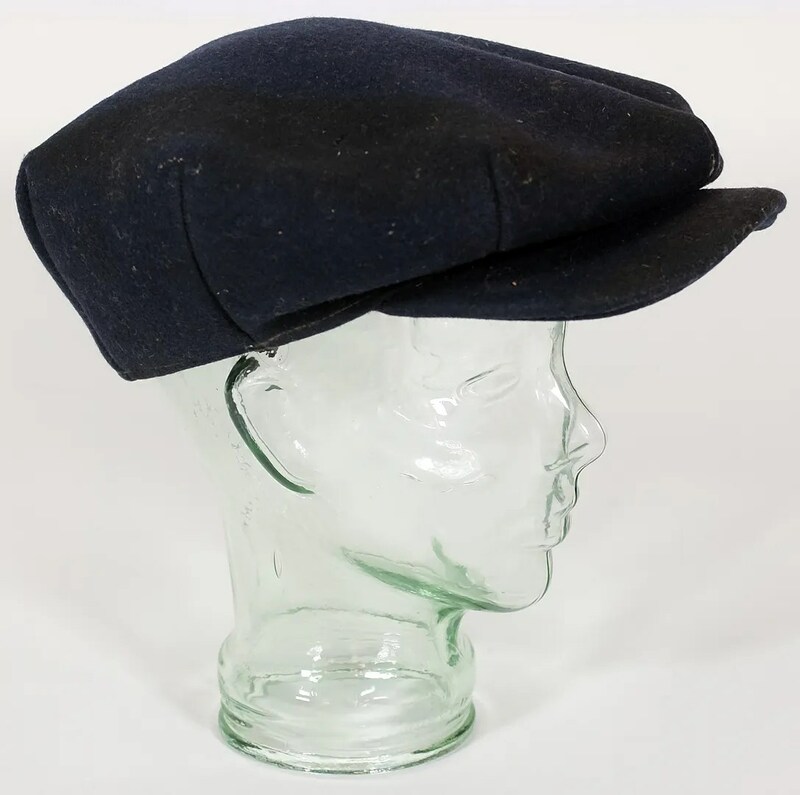 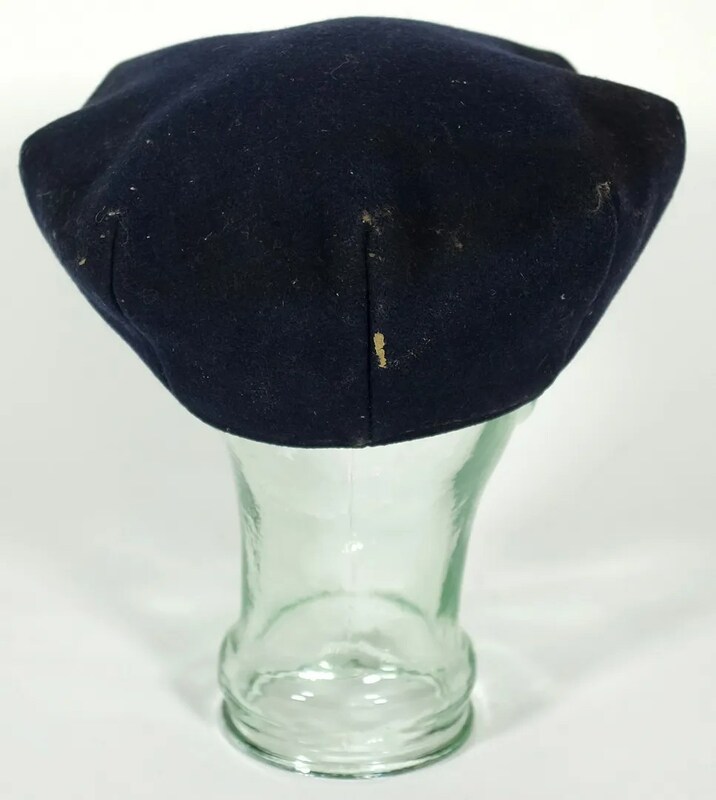 This type of cap is typical of fall/winter workwear caps of that era, and it is rare to find one in this large size and in wearable condition. 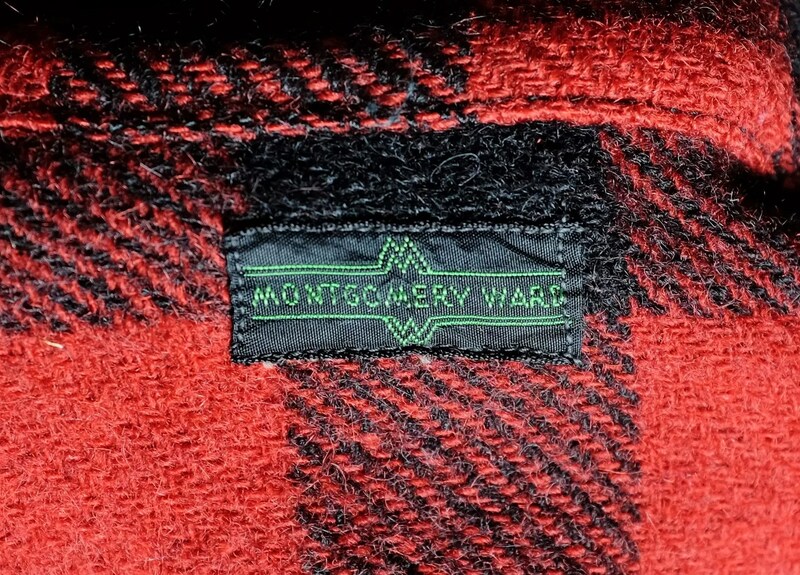 This vintage shirt was made in the 1930s for Montgomery Ward. 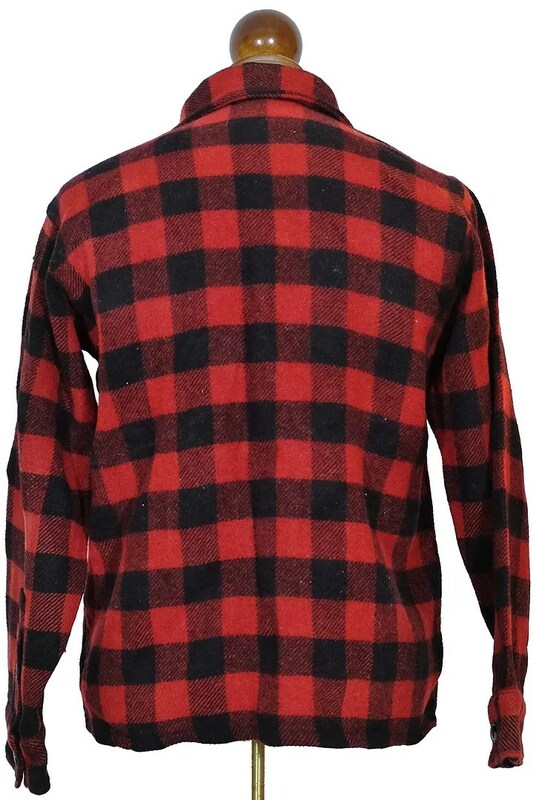 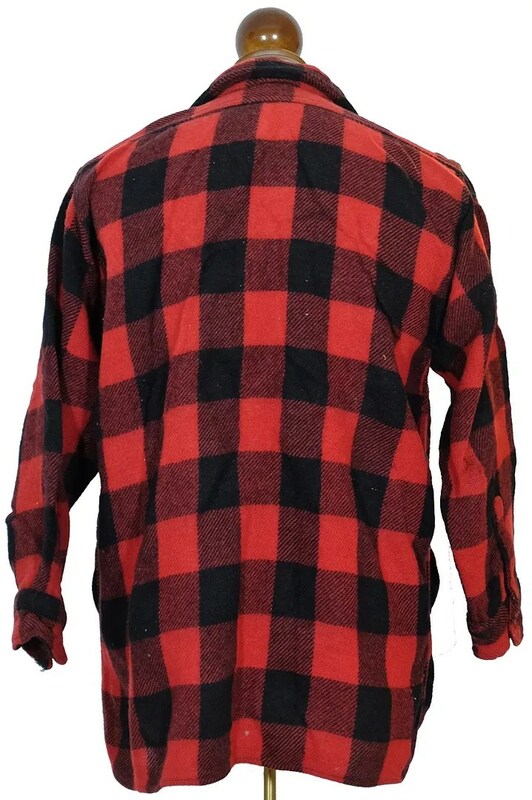 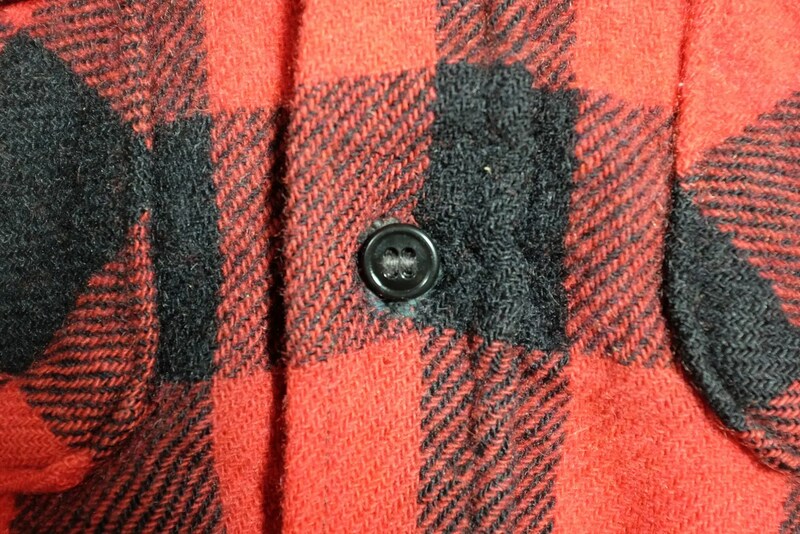 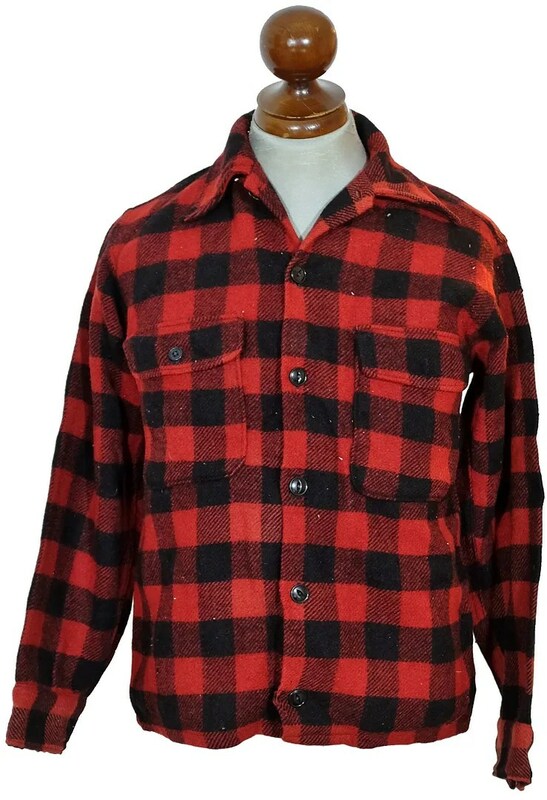 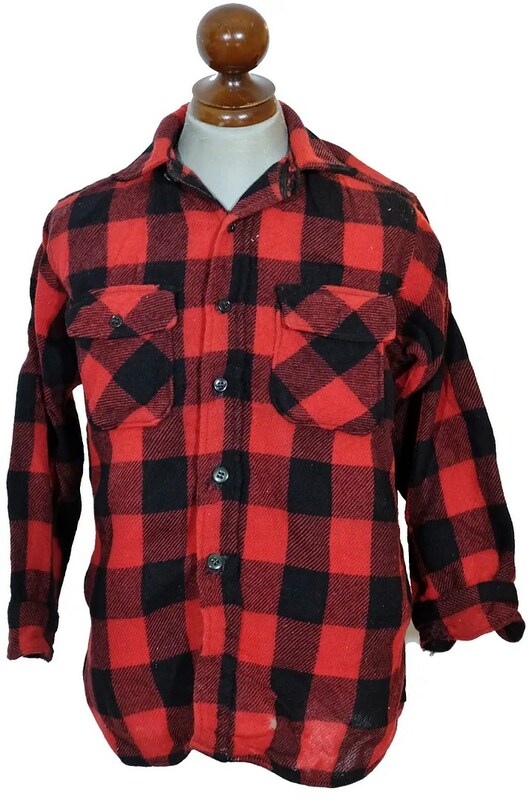 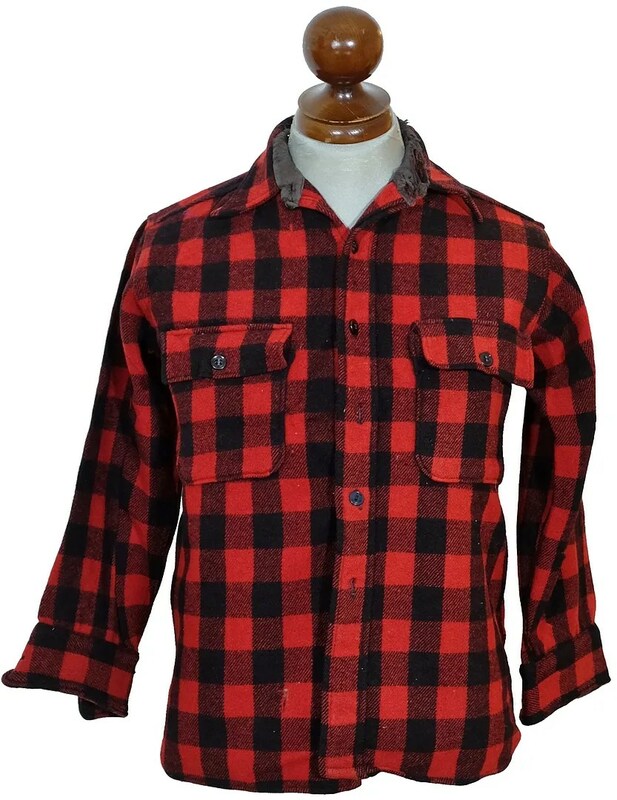 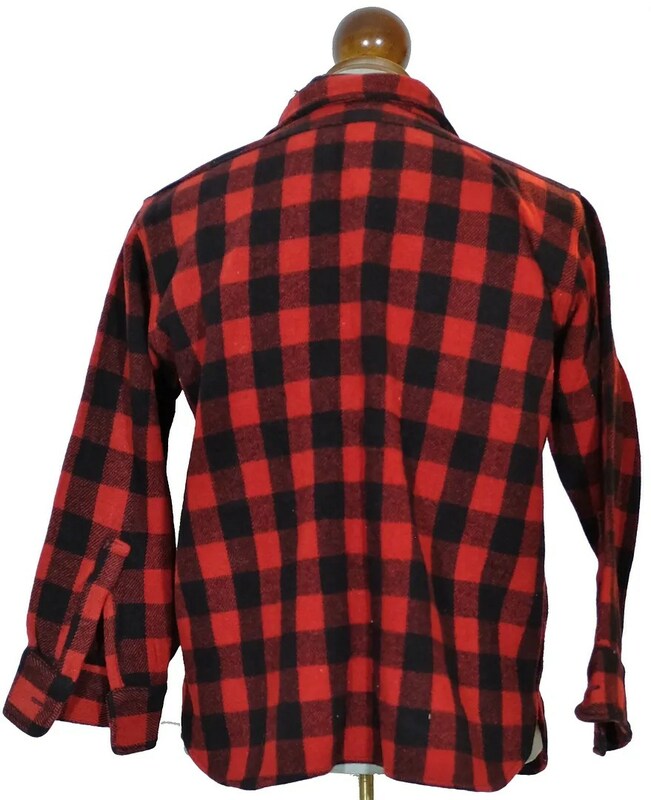 It is made from a red and black wool buffalo plaid. 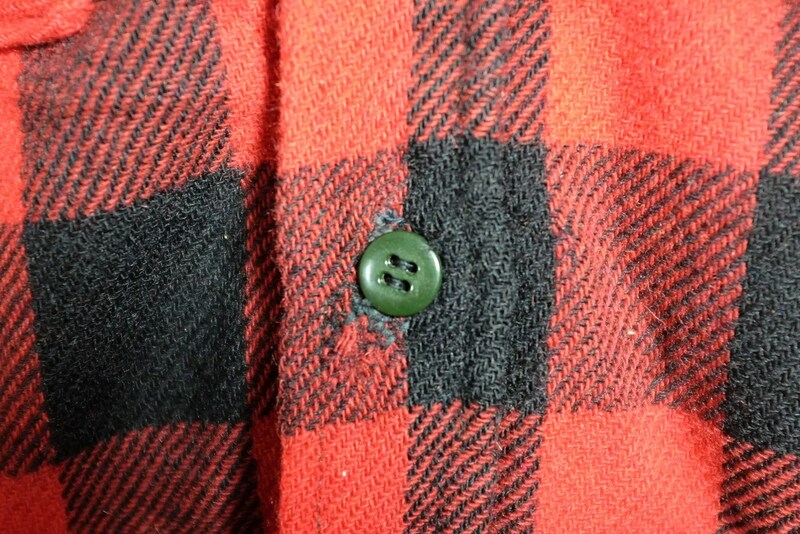 It has two breast pockets, square cut, jacket style tails, large cat-eye buttons and the streamlined MW Montgomery Ward logo. 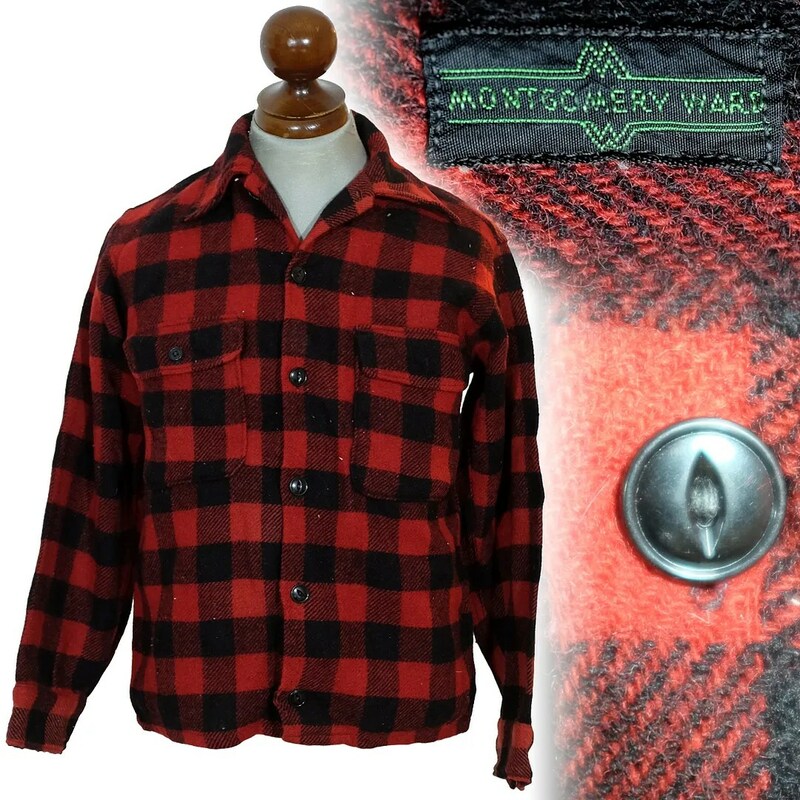 This vintage shirt was made in the 1930s for Montgomery Ward. 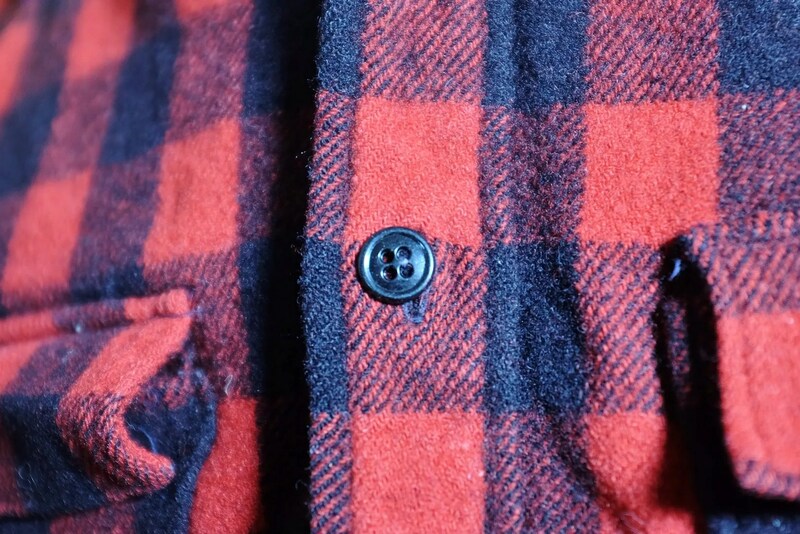 It is made from a red and black wool buffalo plaid, with a cotton lined collar stand. 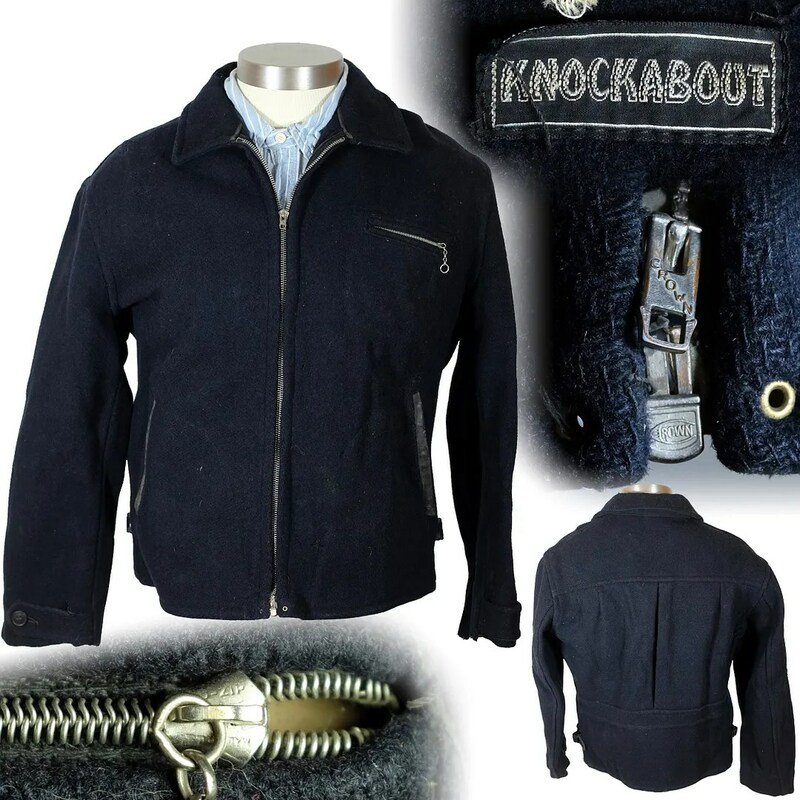 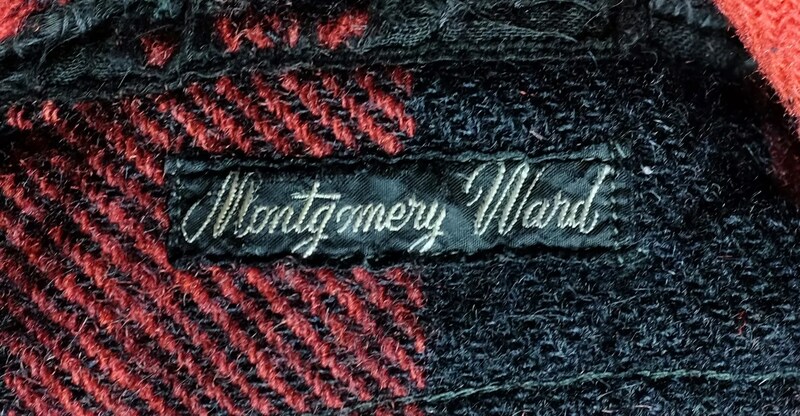 It has two breast pockets, gusseted tails and Montgomery Ward’s name in a script logo. 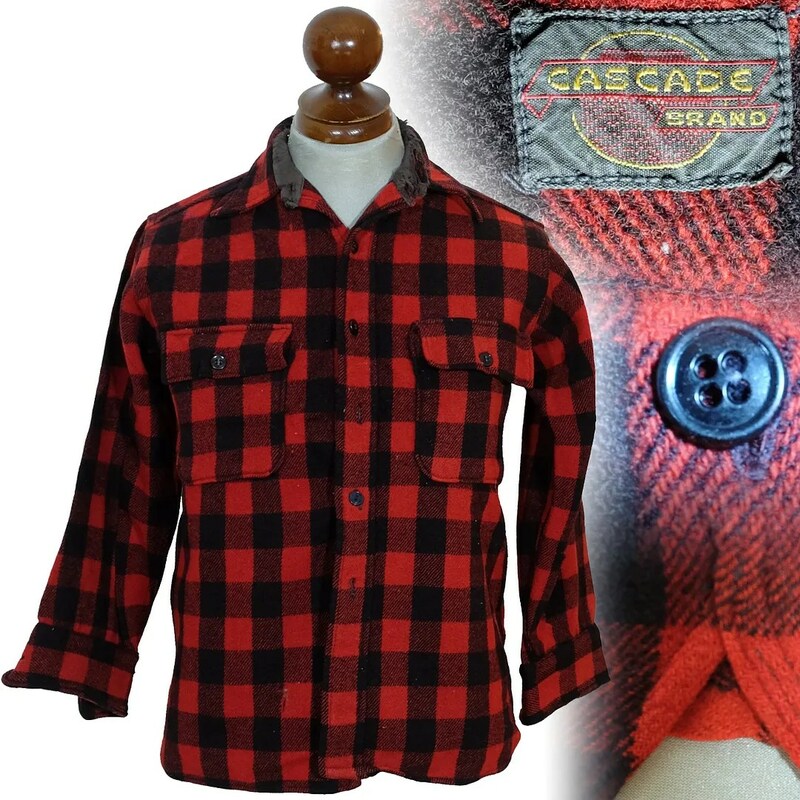 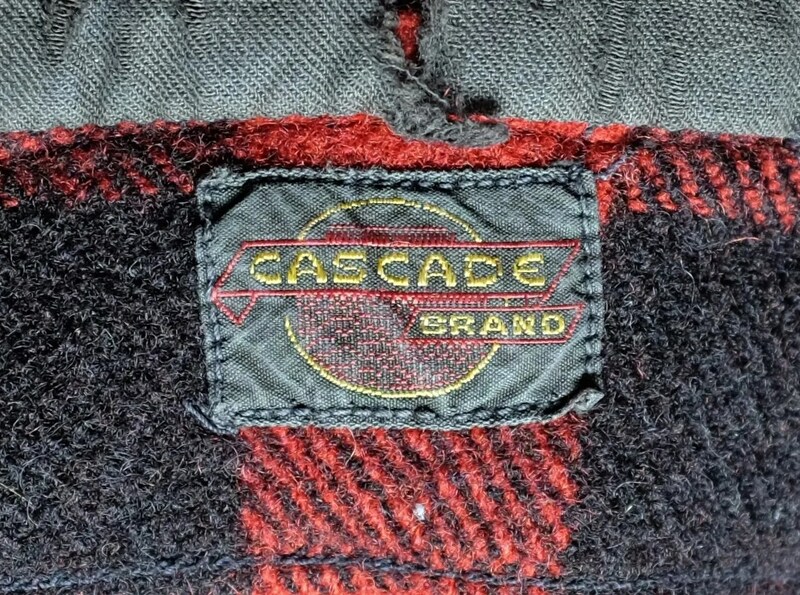 This vintage shirt was made in the 1930s by Cascade Brand. 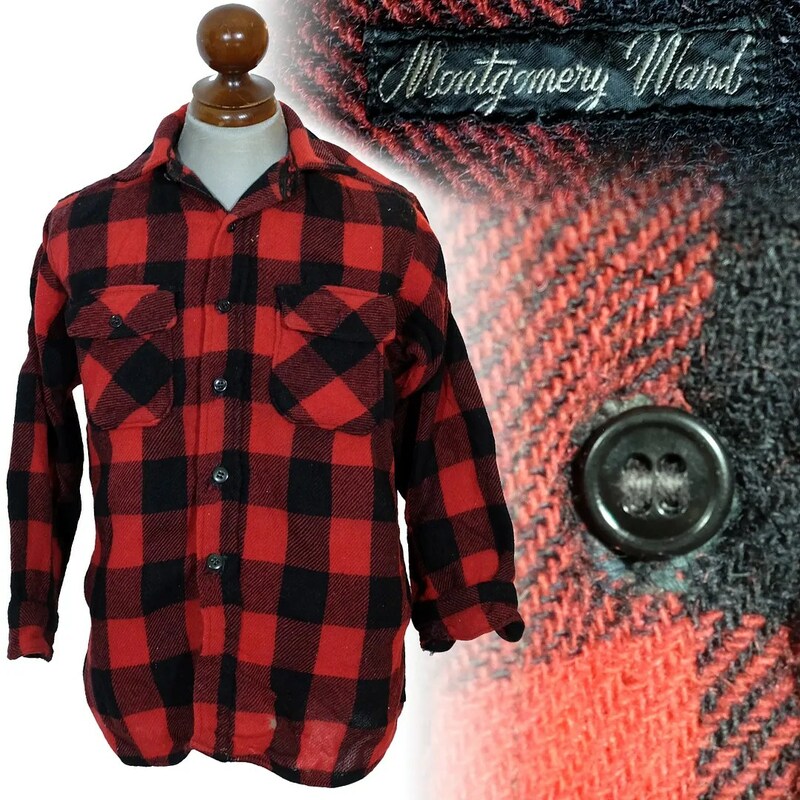 It is made from a red and black wool buffalo plaid, with a cotton lined collar stand. 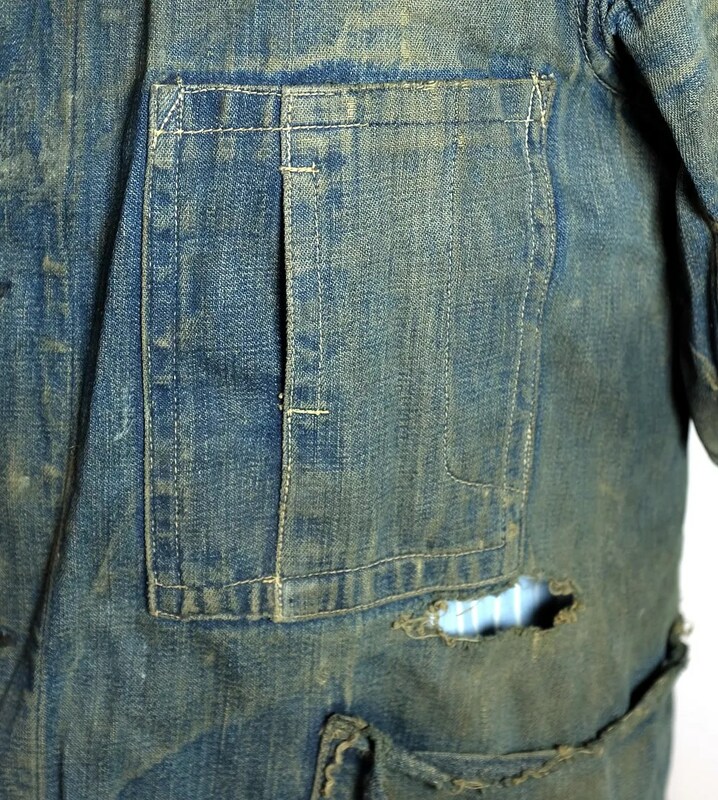 It has two breast pockets and gusseted tails.